Gaia Good Health wanted people to take a sneak peak into their everyday lifestyle and realise the kind of health compromises they make in their lives. In the pursuit of a great life, in the flight towards their dreams, on their route to aspirations, people end up making unhealthy compromises. 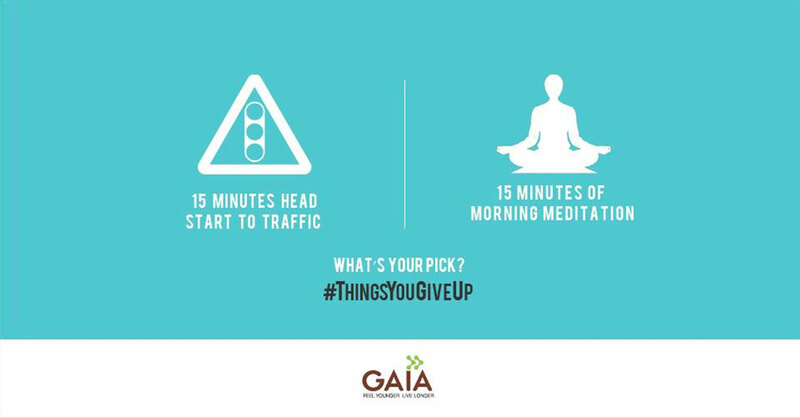 So Gaia took people on a journey of realisation by making them answer the #ThingsYouGiveUp in the context of their health. With responses like these, Gaia connected with their audience and gave them a reality check of their health priorities. 'Skipping lunch for a meeting, sleeping late at night for a presentation the next day, extreme dieting to reduce weight' were some of the answers. Gaia Good Health also created a measure for people to check thier health quotient on a scale of 1 to 10 through a Good Life Test. Over 12 million views and 70% rise in the fanbase. The Good Life Test got 1000 people to check their health quotient. #ThingsYouGiveUp got tweeple talking for 6 hours with over 4700 tweets and 35 million impressions.